Okay, I need burner recommendations! Posted: Wed Feb 22 12 12:22 pm Post subject: Okay, I need burner recommendations! I have a basic home made disco that I got from a friend. I have always used my small turkey fryer burner, but I would like something that is a little bigger. I have seen some nice large banjo burners on here. What do you all use for burners? I am looking for a large, adjustable one. Maybe with two rings? Inner & outer? Where can I get a good deal? I am itching for a small project now that the weather is getting a bit nicer, and would like to build a multipurpose burner. Beertooth, I've been using similar burners. I got the adjustable regulator with it. I'll get more info for you if you want. Kempshark....What you have to look at is adjust-ability. Did not look at the one you mentioned. 100,000 is probably max setting .....you need to know min setting to make that call. Good luck. kempshark, If you order the high pressure , adjustable regulator you should be all set. Maniac, Sorry links make me nuts, I'm computer stupid. I'll give you item #'s on what I've been using. They seem to work very well for me, BWTFDIK. It goes from warming up to jet engine sound. I just got those two parts in the mail from AgriSupply... Though they're not mounted, the pyro in me couldn't help but test them out. Yes, they're capable of some SERIOUS jet noise. Giggity. 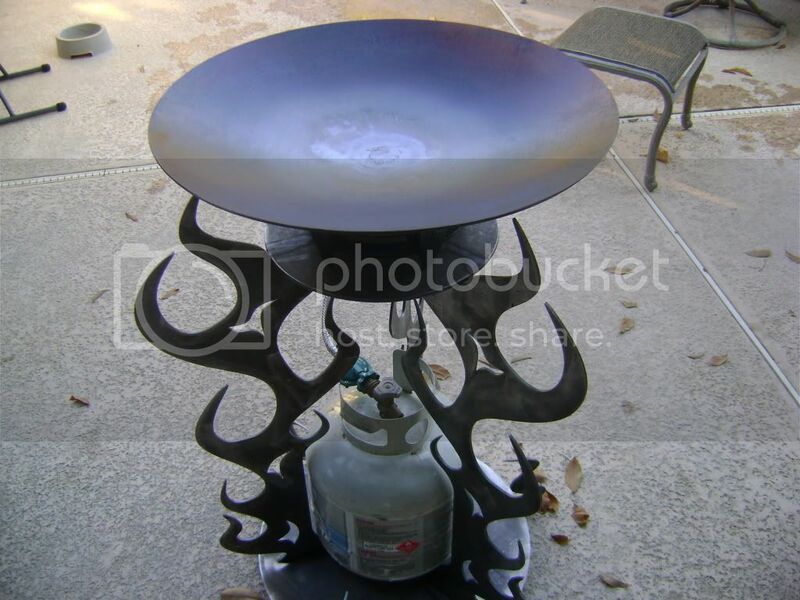 You could always use a "large turkey fryer burner"! Robert, I recommended a 6" low pressure burner to try like this one Burner to Troy it is all you need for a disco in my opinion. 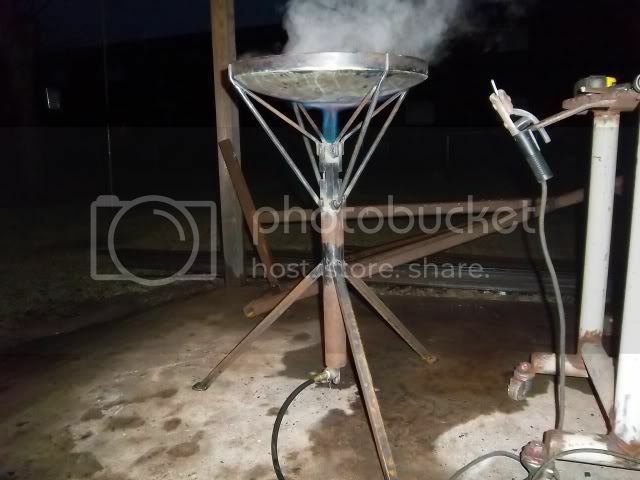 Or you could get creative and build your own burner if your looking for a fun project. I went with the burner that Kevin talked about and I think it works great. If you crank the pressure to it, it does experiecne a crazy uneven flame, but I have yet to cook anything on my disc that needs that much heat, so its no problem. The 6" size gives a good uniform heat in the center of your disc. It works really well and I would recommend it to anyone building a disc. I was at a swap meet in Tacoma, Washington today. I had heard about the place that sells Mexican cooking stuff. They said they carry big comals and burners and stands. I found the stall, and they sure do. They have the now-familiar Alpha burners like we've all been buying off Amazon for $30-40 in the last few months. They also had a high pressure version of the same type of burner for about $65 which got me excited, although I didn't buy one. Tonight, googling, I can only find vague references to it online. The regular Alpha burner has a low and a high heat setting, basically one ring or both, but neither has a very substantial flame. When I get a lot of liquid coming out of my meat I sometimes want to really goose the heat to reduce the liquid. I might try one of those Alpha high pressure burners sometime. They say "high pressure" right on the box and are for sure made by Alpha. The box is bigger than the one that Amazon sent me my Alpha burner in, too. Didn't take a picture, sorry. They had some out-friggin-rageous stainless comals too. Next time I go I'll bring my camera. I've got that "small" burner(BG10) with adjustable regulator on both my turkey fryer and 10 gal chili cooker. They both do double duty for my 22" Disco cooks, and provide all the heat I need. I found myself thinking bigger is better , but decided not to mess with success. YRMV.